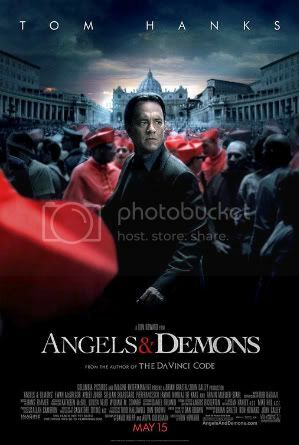 Symbolist Robert Langdon (Tom Hanks) is recruited by Vatican police on the eve of the selection of a new pope to help translate clues that might find the terrorist who hid a ticking-time bomb in Vatican City before it destroys the entire city and the Catholic leaders within it. Arguably the most controversial film of the season, I found A&D to be a serviceable thriller/mystery and better than the previous Robert Langdon film, The DaVinci Code, which isn't much of a surprise since I preferred the book version over it's counterpart as well. I wouldn't call it one of director Ron Howard's better films, but Tom Hanks was excellent, spouting exposition to keep his companions and the viewers up to speed like an enthusiastic educator, yet staying within the action as the movie rolls along as a frantic pace. Ewan McGregor plays Camerlengo McKenna, the previous pope's assistant. While I somehow became overly impressed with his "awesome" hair, McGregor does put on one of the best performance in the film as the young priest who seems to be on the side of the angels. Nikolaj Lie Kaas is fascinating as the devious assassin responsible for kidnapping and killing the cardinals most likely to be the voted the next pope. The gorgeous Ayelet Zurer plays Vittoria, filling the role of the scientist who can "defuse" the bomb, and also fills the role of audience/student for Langdon. As commander of the Swiss Guard, Stellan Skarsgard has the best line in the film when he tells Langdon that his church protects the poor and feeds the hungry, then he asks, "What does your church do? Oh, that's right, you don't have one." The twists and turns and motivations of some of the characters in the movie don't come across quite as well as they did in the book, and some of the controversy seems forced, but I was satisfied with the overall presentation, so I gave Angels & Demons a B. Years have passed since Judgment Day, the day Skynet turned on humanity, intent on wiping out the species. The future of the war balances perilously on the fate of three men: John Connor (Christian Bale), the prophesied Chosen One that will someday lead the humans to victory over the machines; a teenager named Kyle Reese (Anton Yelchin) who's just trying to survive in the ruins of Los Angeles; and Marcus Wright (Sam Worthington), a man who was executed years before the war even began and part of the trap that Skynet has set for Connor and Reese. 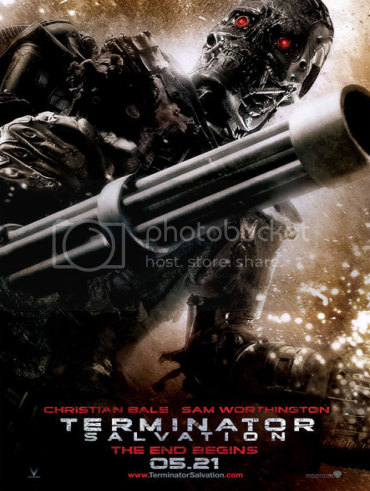 McG (who's best known for directing the recent Charlie's Angels movies) puts together an amazing, enjoyable look into a bleak future where a literal rag-tag resistance fights valiantly against what turns out to be a deviant machine army. While the final product is well-produce, and things blow-up real good, some of the plot seemed like it needed some expanding on, but that may be held in reserved for the DVD and any sequels. Bale's now legendary intensity fills the Connor role nicely, but it's the performances by Yelchin as the young Reese and Worthington as Marcus that steal the show. Reese is not only responsible for his young, mute companion, Star (Jadgrace), but he also has a calm demeanor. The kid's smart and knows not to fall to despair; when things get tough, he keeps resisting, an example to others around him. Worthington's Marcus, while shocked at the world he finds himself in, takes it on as a second chance, a way to nobly atone for the sins of his past. Unfortunately for him, the past won't let him go so easily. There are a few things where you need to just leave your disbelief at the door (I mean, come on, we are talking about a movie who's core-plot involves time-travel), but overall, it was pretty darn good, so I give it a B+.